After Iran Deal Defeat, How Do Pro-Israel Lobbyists Regain Clout? 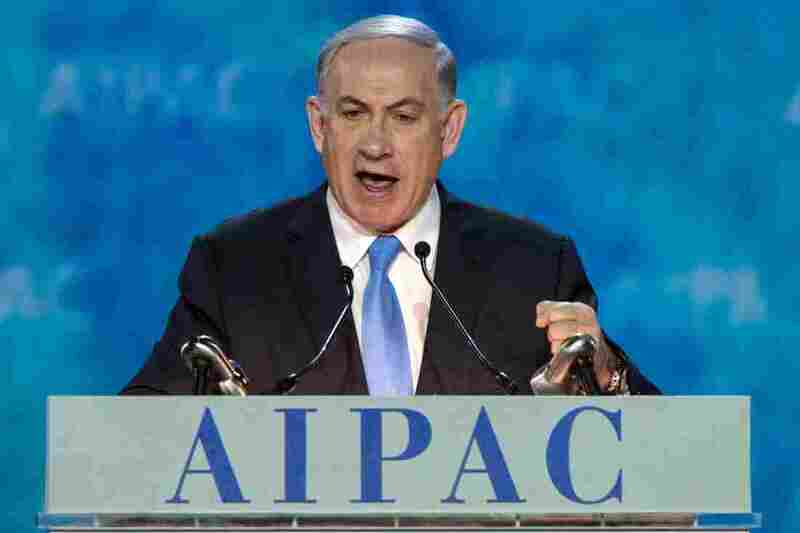 : It's All Politics AIPAC is one of the most powerful special interest groups in Washington. It lost big on the nuclear agreement and is now looking to reassert itself. After Iran Deal Defeat, How Do Pro-Israel Lobbyists Regain Clout? Israeli Prime Minister Benjamin Netanyahu addresses the American Israel Public Affairs Committee policy conference in Washington on March 2. Netanyahu also addressed Congress at the invitation of Republicans, who were strongly allied with AIPAC in fighting the nuclear agreement. Nobody on Capitol Hill underestimates the lobbying clout of AIPAC, the American Israel Public Affairs Committee. For six decades — almost since the birth of Israel — AIPAC has presented itself as the deliberately bipartisan, and frequently victorious, voice of American-Israeli unity. It has maintained this emphasis on bipartisanship even as American views of Israel have grown more partisan. Israel's politics have turned sharply rightward and are now much more closely aligned with American Republicans than with Democrats. It's something Steve Rosen couldn't have imagined when he worked as AIPAC's foreign policy director from 1982 to 2005. "If AIPAC became a Republican organization it would cease to exist," he says. So here's AIPAC's problem: While it's been walking that bipartisan line — it maintains its board of directors as a mix of Democrats and Republicans — Mideast politics in Washington have become a partisan football. Netanyahu and the Republicans used his visit to underscore their united opposition to the deal. AIPAC isn't in the business of opposing Israeli government positions. So it entered the partisan fray and opposed the Obama administration. Aaron David Miller, a former Middle East negotiator for the State Department and now a scholar at the Wilson International Center in Washington, said AIPAC's mission was doomed from the start. "This pro-Israeli community has a powerful voice, there's no question about it," Miller said. "But it does not and has never had a veto over what a willful and skillful and determined American president does." AIPAC's spokesman declined to speak on the record for this story. The group has lost big battles before: over proposed arms sales to Israel in 1975 and 1980, and in 1991, when President George H.W. Bush postponed $10 billion in loan guarantees. Miller said, "They lost all three of these fights. And yet no one could argue that 15 or 20 years later, this organization has any less influence." In fact, after each of those battles, AIPAC membership and fundraising spiked. In special interest politics, there's nothing like a high-profile loss to make supporters open their wallets. AIPAC has rivals in the pro-Israel lobby, most notably J Street. It's younger, more liberal, and much smaller. Last year J Street spent $400,000 on lobbying, compared with $3 million by AIPAC. J Street President Jeremy Ben-Ami said the outcome on the Iran deal, by itself, is not a turning point. "It's not everything changes from here on in. But one will look back at this and say this was a very important moment," Ben-Ami says. "And from here on in you can't talk about the American Jewish political community the same way that you did before." AIPAC's backers dismiss J Street as just the latest of many attempts to build a more liberal pro-Israel advocacy group. They can run through a list of similar efforts that failed. In the short term, Congress is expected to produce a big aid package for Israel, giving the factions on Capitol Hill a chance to kiss and make up. But conservatives are exploring possible amendments to obstruct the Iran deal. Ben-Ami said that would cause trouble. "If that legislation is used as a Trojan horse, to contain poison pills that are designed to undermine the deal, then there's going to be yet another fight," he said. And at the same time, AIPAC members will start deciding how — and whether — to reconcile with Democratic lawmakers who chose Obama over AIPAC in the debate over the nuclear deal. "How they move ahead and support those members of Congress or support others to replace them, is an open question," said Josh Black, a former AIPAC spokesman who now heads a nonprofit group called the Israel Project. "You know, in politics hindsight isn't just a matter of hindsight. It's a matter of accountability."